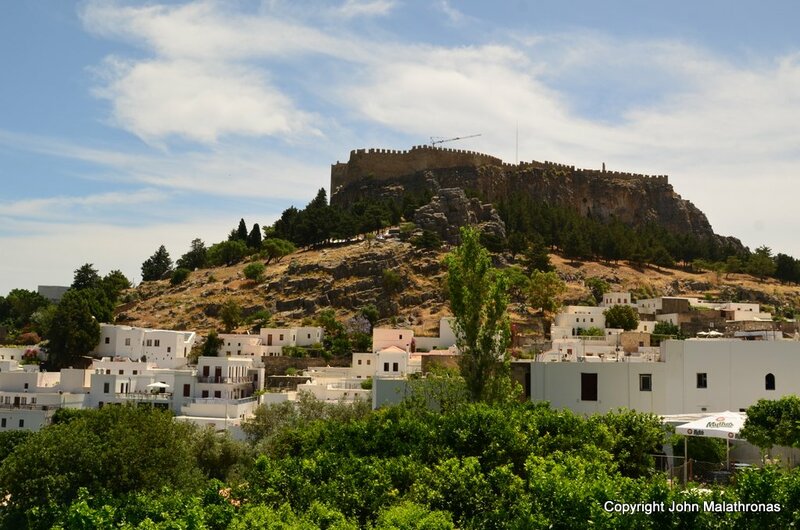 I was recently in Rhodes and I could not miss out on Lindos; everyone who’d been there was raving about it. Not only is the village picturesque, but the Acropolis looming above it is one of the most important ancient temples in the Aegean. Only 5€ and 90 mins away from Rhodes town by bus, so it was a no-brainer. Loved it – but why? 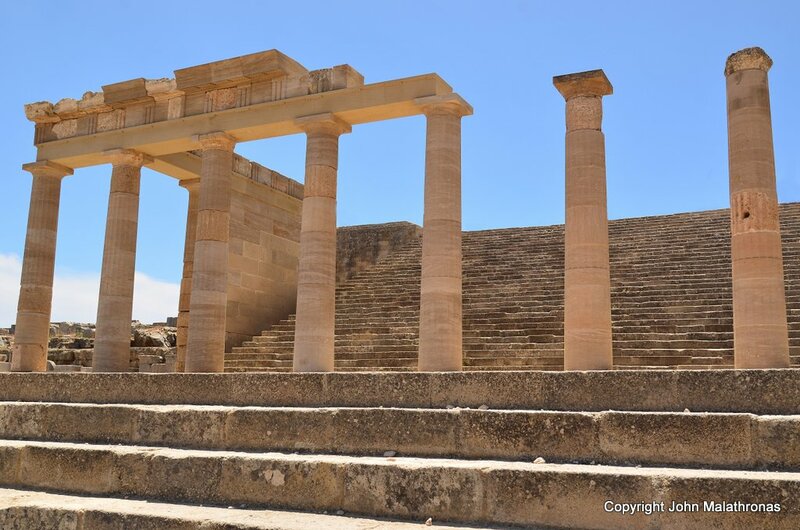 The first reason you should go to an Ancient Greek temple is its siting. Whether in a lush valley like Olympia, down the slope of a mountain like Delphi, or on top of a rock like the Acropolis of Athens, I’ll let you into a secret: the Ancient Greeks chose the most scenic places to build their temples. 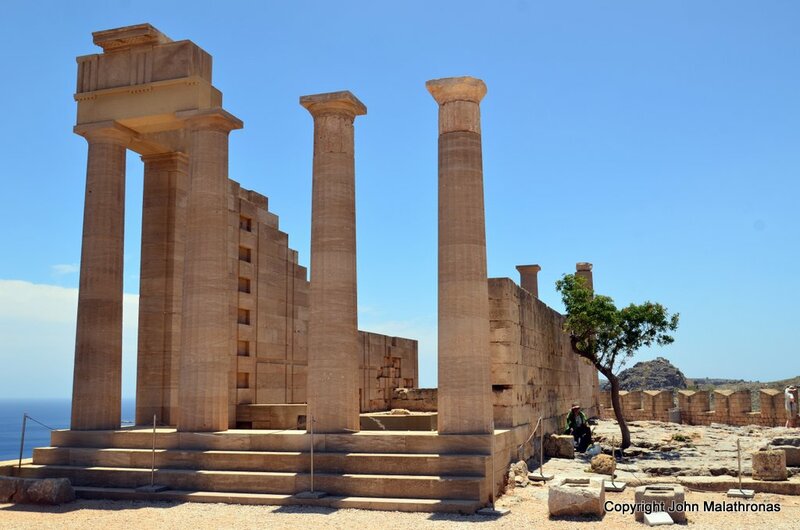 And so it is with Lindos (or to be specific the Temple of Lindian Athena). Perched high above the village, it is squeezed between two beautiful bays. St Paul took shelter in the south to escape a storm and gave that bay his name. 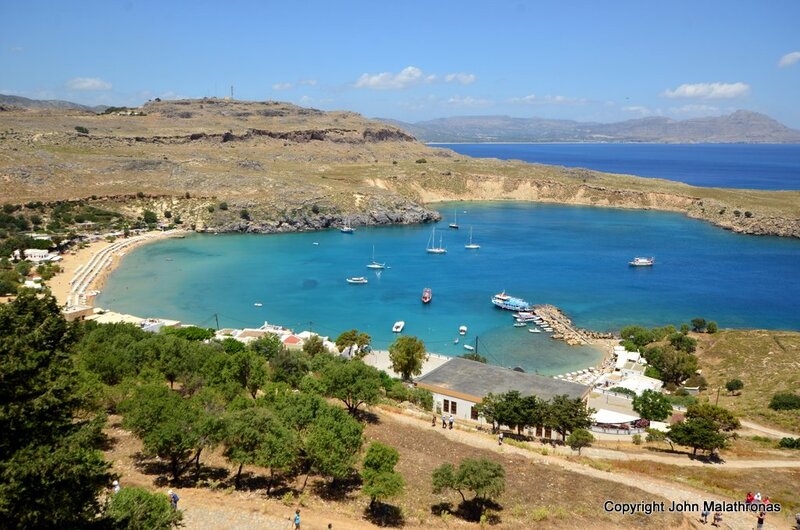 Looking north from the Acropolis of Lindos: the Grand Harbour. 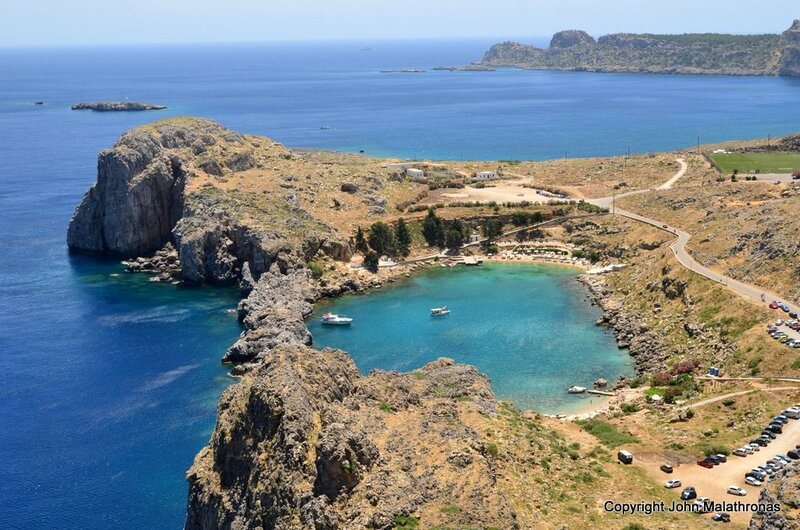 Looking south from the Acropolis of Lindos: St Paul’s Bay. Then there is the scale of the temples that belie their history. We normally see a pic of the main sacred temple, like the Parthenon without realising it is but one of many different temples on the Acropolis of Athens. 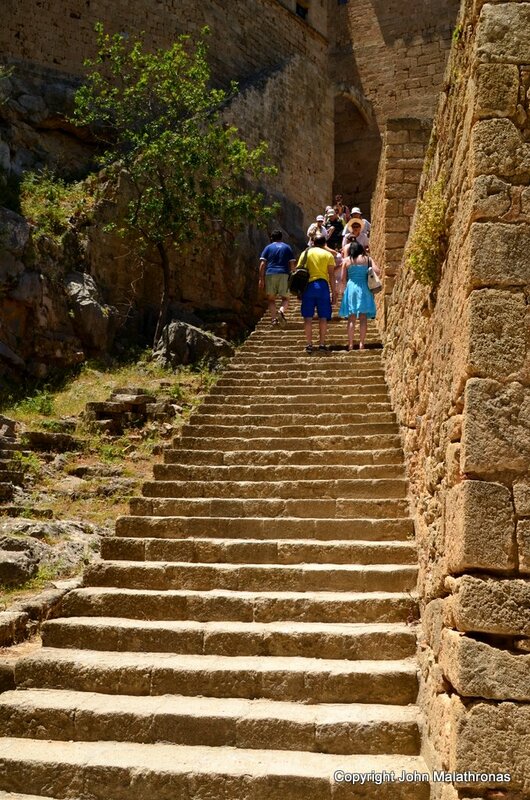 In Lindos there is a long stairway leading up (the Sacred Way); and as what we see now belonged to four phases, in three levels. There is the main temple itself, which was restored in 392BC after a fire; the Propylaia (a colonnade at the top of a new flight of steps) which dates to just after that; the stoa at the bottom of the steps twenty tears later; and the terrace with additions around 100BC. The Temple of Athena at the very top. The church of St John. And finally there are the little details. The various stones used for building; this is the lower terrace. In this picture of the lower terrace below the Propylaia you can happily see the three main types of stone used in various epochs. 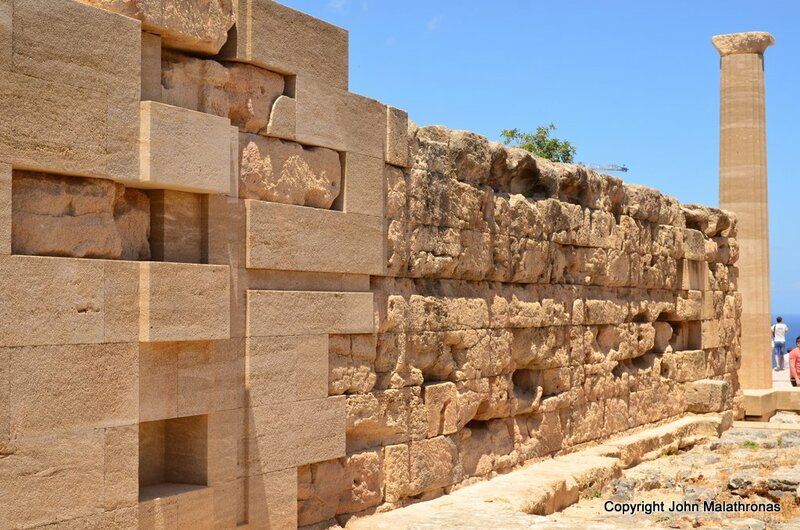 The grey marble was quarried in Lardos, west of Lindos. The porous red stone comes from Mt Attavyros, the highest mountain on the island. 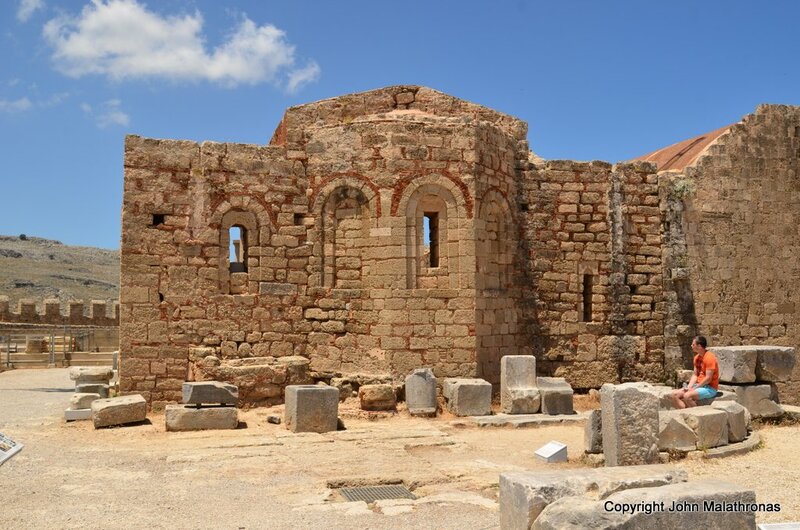 And finally the small honey-coloured stones is what you find locally on Lindos itself. But there is more. Do you see those black marks inside the temple? 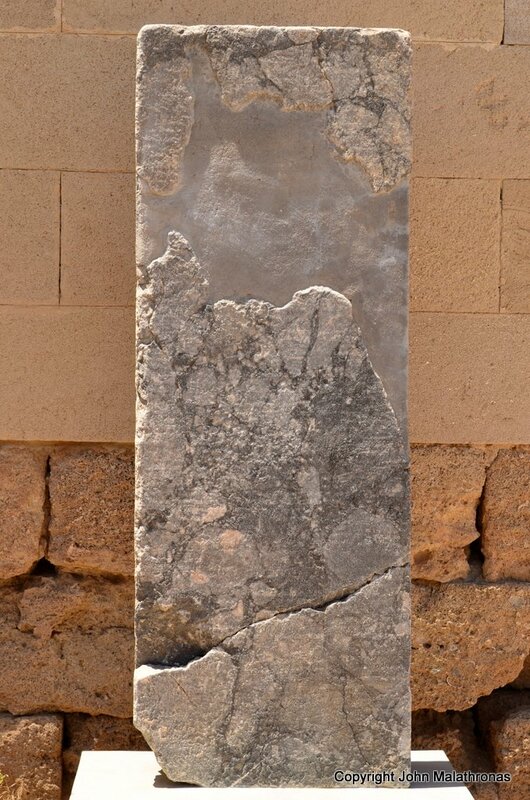 There is no mould in this dry Aegean island. Remember that fire in 392BC? These are charred interiors that are still visible from that fire! The charred interior still showing the marks of the fire. Now remember that this was a place of worship. So what are these? In fact, these are collection boxes where pilgrims threw in their ancient drachmas. They are bloody difficult to move so they’ve stayed in the same place for 25 centuries. And this boring inscription? What can it be? It is in fact, as it says, a list of contributions by 185 persons who chipped in all together in 115BC to buy three gold wreaths for Zeus, Athena and Nike. The sum comes to 1455 drachmas which means some important event was commemorated. [And not only that: significantly, we also have 33 women amongst the donors which means that they were allowed to own property.] So this is the same as a sponsor’s plaque these days in a Royal Academy Exhibition. 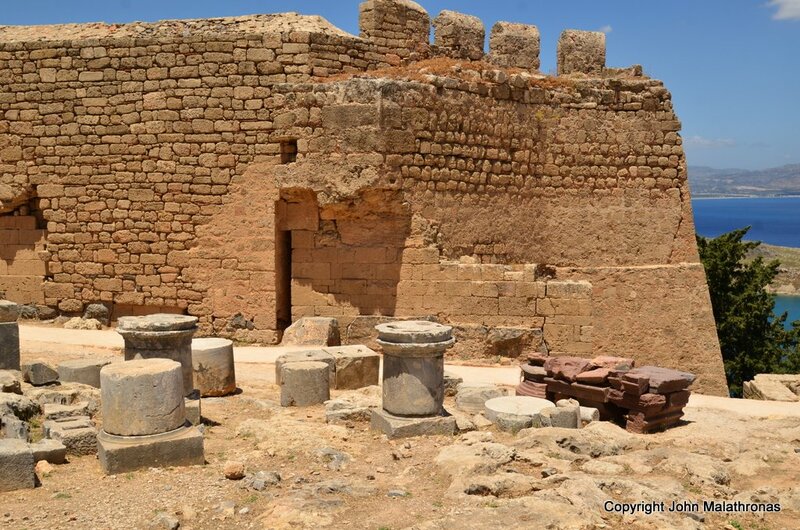 So there you have it: visit an ancient Greek temple because it will be sited in a fantastic spot; check out its varied history; and try to find the details that can still vividly bring to mind how the people lived 25 centuries ago. You can’t do that in many places. But you can on Lindos. Nice blog containing good travel tips i really like the tips it will be useful at the time of travel.